Runs with Sole: All-new Women's Running Program! I am excited to announce the next installment in my Women's running programs: Women's 10K and Half Marathon Running Program! Whether this would be your first race or your 50th, chances are you've never trained in a more fun, supportive and motivating way! New runner? Experienced runner? It doesn't matter! This is the program for you! Start your New Year off on the right foot and join us as we redefine the term "Girls Night Out!" In this program, you'll reach your goals in a fun, supportive environment with guidance and encouragement from an experienced coach along the way. Program Logistics: We will meet Tuesdays starting 2/19 at 6:30pm. The group will also meet on Sundays at 8:00am. 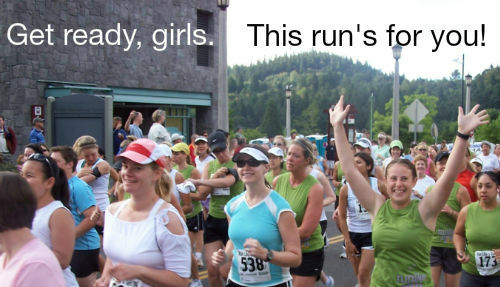 The group will be training for the Girls on the Go 10K or Half Marathon on May 11, 2013. The cost of the program is $100 which includes a detailed 12-week training program, two weekly coached runs, information seminars, discounts on running gear and much more! Race registration isn't included in the program fee. Questions? Email me at jenn@solehealthandwellness.com with any questions you may have.